Atlanta never fails to rise again, though when it comes to golf, the heart of the South keeps giving golfers a reason to come back. Small-town Southern hospitality still permeates Atlanta, as the city of more than four million manages to combine all the amenities of a bustling metropolis with the charm of the capital of the South. While veteran golfers likely have plenty of experience on Jack Nicklaus-designed courses, Bear's Best offers a golfer's the opportunity to play 18 of Nicklaus's besthole designs. The course showcases some of the great holes from such Nicklaus designs as PGA West, Muirfield Village, CastlePines and Shoal Creek. A relatively new course, Bear's Best plays 6,850 yards from the tips and very playable for most levels of golfers. The par-4s have birdies waiting to be picked up, which should be helpful if you have any troubleon the par-3s, two of which are to tricky, water-surrounded greens. The course is in immaculate condition throughout the year, and the forecaddie program gives you a feeling of playing a private course, making the $65+ green fees seem more investment than outlay. Woodmont Golf Club offers Robert Trent Jones, Jr.'s first design in Georgia. The beautiful scenery is complemented by five par-3s and par-5s, giving players ample opportunities to keep down scores. Tough greens on the back nine will do little to take away from your experience, as the course's upkeep, staff and overall playability over 6,830 yards makes it one of Atlanta's top golf destinations. Also, a word of advice: Jones himself played with a slice. You'll notice how many of the holes are either doglegged or use hills to take advantage of a right-hander's slice. So, if you're tired of courses that can be player friendly and want aserious challenge, Crooked Creek Golf Club is the place to go. It should run in the $75 area to get on at Crooked Creek, but the Mike Reilly design is well worth the price. Duffers will love the clear shots off the tee to the fairway, but better be prepared to work the irons, as many of the holes have elevated and well-bunkered greens and other challenges for approach shots. The greens have subtle breaks which can punish the impatient, but thefirst-class amenities of the course will give you some comfort when adding up the scores after playing this 6,960-yard, 137-slope course. Cobblestone Golf Club is as good of value as you may find in Atlanta. With fees in the $50s, this 6,759-yard course with a 140-slope rating will challenge golfers of all levels. Terraced greens, lakes and deep bunkers highlight this scenic course that requires an able short game to put up good scores. Despite the factthat Golf Digest gave it a Four-Star rating and Golf Magazine named it as "A Top 100 Course You Can Play," the staff is very welcoming to walk-ins. Windermere Golf Course is where you'll find Davis Love III's first foray into course design, and the results make you want more from the 1997 PGA Championship winner. Winding through a planned community, the course rewards long hitters,especially on the Par-5s, where long hitters should be able to take a shot at getting on in two without being severely punished for mistakes. The par-4 No. 12 offers a beautiful view from a 200-foot elevated tee box. "Our family's years with the tour and rich golf heritage, have given us a unique perspective on course design," Love III has said, and his perspective is one worth forking over the $70+ to play. The charming Olde Atlanta Golf Course offers a well-manicured course that rewards accuracy. Water, bunkers and tight tree lines will force some adjustments from golfers just wanting to stay on the fairways, while thepar-5s and some of the par-4s will give long hitters the challenge they always are wanting. While not really "olde" (Olde Atlanta turned 12 this year), the course measures 6,789 yards and has a slope rating of 137. More than anything, this Arthur Hills-designed course is for shot-makers, as a hilly terrain with several elevated greens will test the iron play of golfers of all levels. Tom Fazio's 7,018-yard, 137-slope Frog Golf Club is a little less predictable than the normal Fazio course,with waste bunkers and false fronts on the greens coming into play. Ironically, not much water on the course, though you'll enjoy keeping dry with green fees in the $50-$75 range. Orchard Hills Golf Club is a local's favorite, with its bow to Scottish links play. As an added plus, designer Don Cottle managed to import someof Scotland's wind to the 27-hole course. Most locals don't seem to mindthe extra challenge, however, especially with green fees in the $50 area. Hamilton Mill Golf Club is 30 miles outside Atlanta and represents Fred Couples' early course design work. Near Hartsfield International Airportare River's Edge and Wolf Creek, which both present good values for players just off the airplane and looking to be on the fairways. 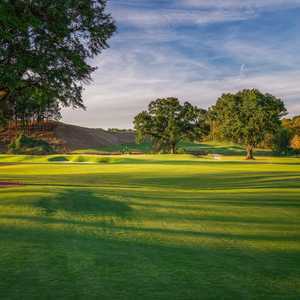 Another 25 minutes from townwill take you to Arnold Palmer's Cherokee Run, one of the King's more adventurous creations. Rathbun's has taken the mantle as the new Atlanta hot eatery, with reviews on the Today show. Right next door, the new Krog Bar features Mediterranean-inspired cold plates, gelatos and coffee. There are plenty of places to stay within city limits, of course, buta short drive will take you where the scenery is. The Renaissance Pineisle Resort & Golf Club is surrounded by the Lake Lanier and located in the foothills of the Blue Ridge Mountains. Atlanta's symbol is the Phoenix, a legendary bird of Egyptian mythology that rose from its own ashes with renewed strength and beauty. The Frog and Cherokee Run are the best values in the area in my opinion. Bear's Best and the Alpharetta courses are all over-priced and over-rated. there is no way cobblestone is nicer than the frog.